I really can't be more appreciative to be part of such a loving blogger group - The New York Bloggers' Collective- we are all just so willing to help each other out specially during NYFW. If only we can make multiple copies of ourselves then we would be able to cover EVERYTHING we are giving invites to. Thanks to Chris at The Tiny Tie Rant for covering Nicholas K while I was at work! 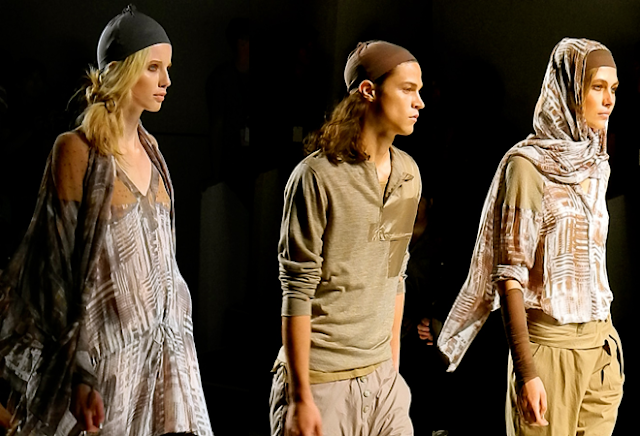 Three words: Bedouin-Geek-Chic. That is Nicholas K’s vision for Spring/Summer 2013. Think plenty of khakis, beiges, hunter greens, oranges, blues, and whites—the color scheme one would find amongst the desert landscape. Low hanging cowl necks echoed the cascading drapes of season’s past that have now become synonymous with the designer’s aesthete. Belted billowing pants and trousers, along with loose hoods and skull caps topped off with oversized sunnies (that came close to being goggles) are some things one imagines a fashion nomad would wear while braving the winds of the Sahara. The soft earthy colors and flowy composition seemed a more relaxed look. It veers away from jarring brights and neons, which have now become a Spring/Summer staple. Slight colorblocking within angled parts of the clothes made for an interesting geometric design. As for the menswear, this collection should be an easy thing for men to transition into. Having been constricted by the layering during the winter, a move to loose-fitting henleys and jackets would be a welcome change. The only thing that could be considered slightly uncohesive was the cable knit sweaters and the sudden emergence of stripes, which bordered on collegiate prep. 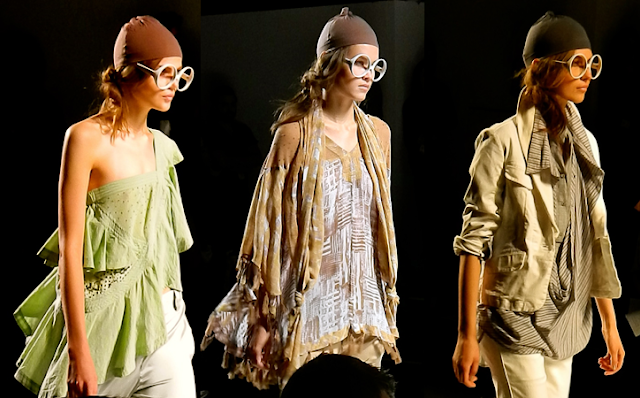 Overall, the collection was executed nicely, playing on the strength of the designer’s effortless draping and soft-toned palette for springtime in the desert. I like that Nicholas K did a completely different color palette from what everyone else was showing!